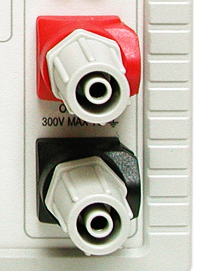 The terminals used on the majority of laboratory power supplies and electronic loads are in the form of binding posts (Fig. 1) that can accept 4mm open plugs into the front, and bare wires or spade terminals into the body. However, concern over personal safety has caused an increasing number of organizations to prohibit the use of bare ended connections within a laboratory environment. 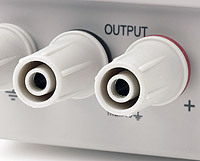 Instead, they stipulate that all connections must be made using shrouded 4mm plugs which are incompatible with normal 4mm binding post terminals. Until now, the only solution for these organizations has been to purchase power supplies and loads fitted with 4mm safety sockets similar to those used on digital multimeters (Fig. 2). These power supplies are restricted to use with 4mm plugs only, and have no facility for accepting bare wires or spade terminals. 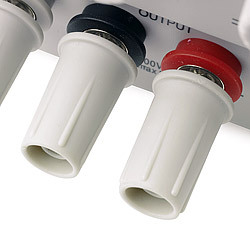 Aim-TTi wanted to offer a product that was fully compatible with the requirements of organizations who require that all connections are made with shrouded plugs, whilst retaining the flexibility to accept all forms of bare ended connections. The new terminal design (Fig. 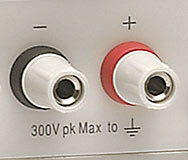 3) does exactly that, and is exclusive to Aim-TTi power supplies and electronic loads. The limited opening distance of the terminal, combined with the raised flange around the metal connection surface, ensures that the clearances are sufficient to make the exposed metal parts "touch proof" when voltages in excess of "extra low voltage" are being used. 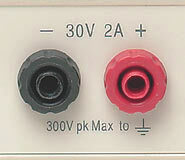 In addition to the standard terminals, rated at 30A, there is a higher power 60A version used on the larger power supplies. The product illustrations within the description pages and PDF brochures on this website may not all yet reflect the use of the new safety terminals.